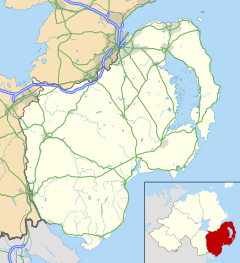 Scarva (from Irish: Scarbhach) is a small village and townland in County Down, Northern Ireland. It is at the boundary with County Armagh, which is marked by the Newry Canal. In the 2001 Census it had a population of 320. Scarva is famous as the location of the "Sham Fight" Pageant on 13 July every year. The Pageant attracts thousands of members of the Royal Black Preceptory, a group related to the Orange Order, who come to march and stage a symbolic (sham) re-enactment of the 1690 Battle of the Boyne. In June 1690, a Williamite army of 30,000 men camped in the Scarva area for training before marching on to meet the forces of King James II at the Battle of the Boyne on 1 July 1690. Whilst training his army, King William is said to have camped under a magnificent Spanish chestnut tree. The tree still flourishes to this day and measures over 25 feet in circumference at the base. Scarva is beside the Newry Canal Towpath, one of eight long-distance Waymarked Ways in Northern Ireland. The Canal operated for over 200 years and yielded employment and wealth for the towns and villages along its length. However, the growth of the railway led to its closure in 1947. The local football club is Scarva Rangers, which was formed in 1972 and play their home matches at Scarva Park. Scarva railway station opened on 23 March 1859. ^ "Scarva station" (PDF). Railscot - Irish Railways. Retrieved 2007-08-28. Wikimedia Commons has media related to Scarva.